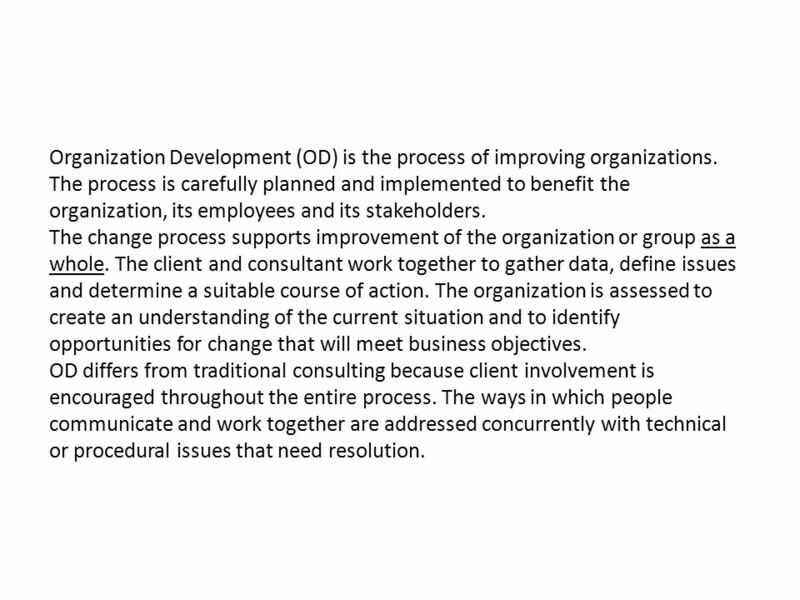 1 Organization Development (OD) is the process of improving organizations. The process is carefully planned and implemented to benefit the organization, its employees and its stakeholders. The change process supports improvement of the organization or group as a whole. The client and consultant work together to gather data, define issues and determine a suitable course of action. The organization is assessed to create an understanding of the current situation and to identify opportunities for change that will meet business objectives. OD differs from traditional consulting because client involvement is encouraged throughout the entire process. The ways in which people communicate and work together are addressed concurrently with technical or procedural issues that need resolution. 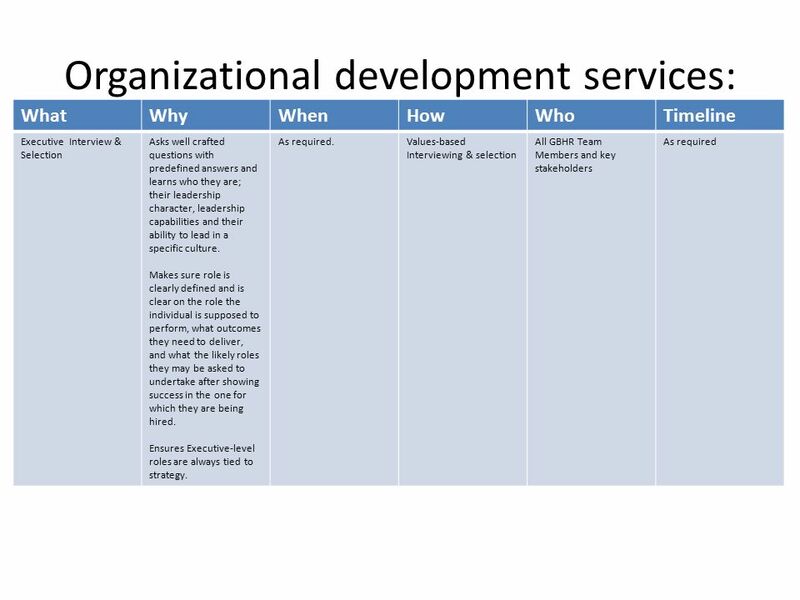 What Why When How Timeline Organizational Diagnostic The effective diagnosis of organizational culture, and structural and operational strengths and weaknesses are fundamental to any successful organizational development intervention. Employee Engagement declines, increase in attrition, prior to a restructuring, plans to grow a business or divest, assess leadership and colleague capability, prior to a large-scale change or training initiative, cultural assessment. Star Model, (Jay Galbraith) Assists in defining the Organizational Strategy (Goals/Tasks), People, Reward Systems, Information and Decision Making, Organization Structure. Approximately 3 – 6 weeks for assessment, analysis, report out, action plan, solution development and implementation, as appropriate. 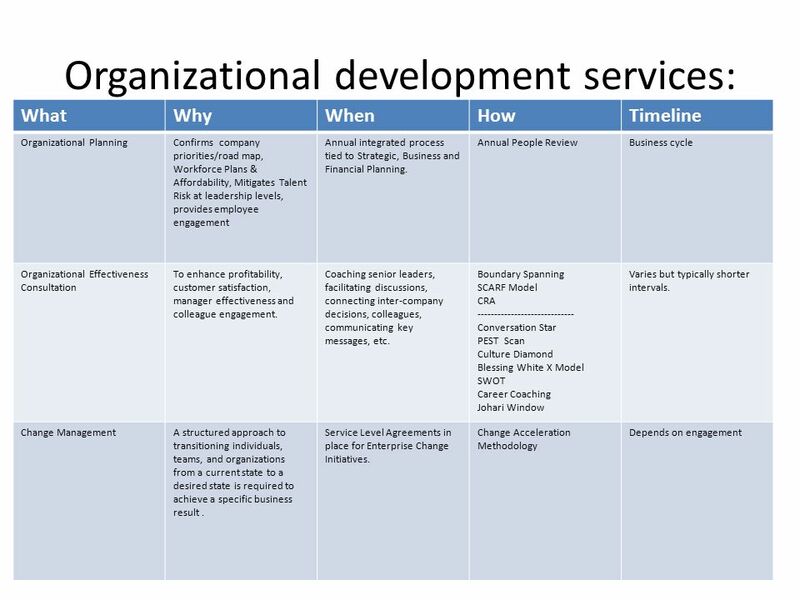 Organizational Design To create business hierarchies, staffing levels to operate efficiently. Organizational structures assign clear roles to departments and individuals to provide them with a sense of purpose and responsibility. Newly forming organizations, New Operating Models required for new businesses, Reorganizations, etc. 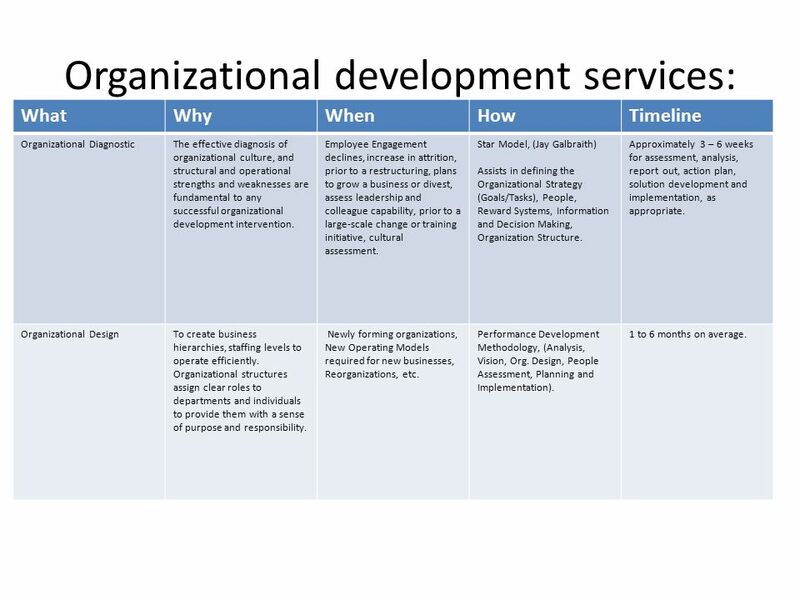 Performance Development Methodology, (Analysis, Vision, Org. Design, People Assessment, Planning and Implementation). 1 to 6 months on average. 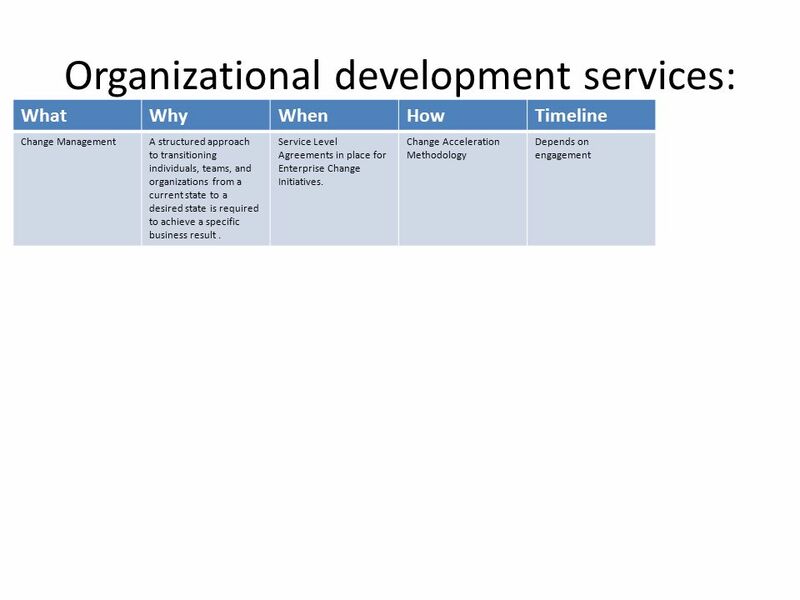 Download ppt "Organization Development (OD) is the process of improving organizations. The process is carefully planned and implemented to benefit the organization,"
E.g Act as a positive role model for innovation Question the status quo Keep the focus of contribution on delivering and improving. * * Chapter Seven Management and Leadership McGraw-Hill/Irwin Copyright © 2012 by The McGraw-Hill Companies, Inc. All rights reserved. By Saurabh Sardesai October 2014. Talent Acquisition, Staffing, Recruitment, Executive Search.